The project involved over 20 of my friends (and friends' friends) and 15 orphanages. We had at least one person at 14 of the 15 orphanages. We were there in order to help with the delivery and the distribution (and get some pictures for you, O esteemed reader). When I initially spoke to McDonald's, I'd asked for a burger, fries, a bottle of water (because many of the orphanages were against fizzy drinks) and a toy. What they turned up with was the burger and fries, iced tea, toys, colouring books, balloons and paper crowns. For the most part, they were also incredibly punctual. The whole thing began (for me) around 11:00 AM. 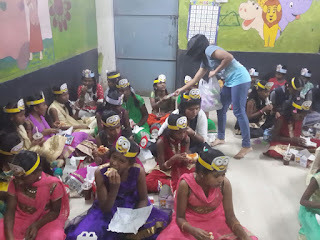 One of the orphanages, Shishu Mandir, which had said that it had 210 children the previous day, suddenly told me that only 35 of the kids were at the orphanage. That created the problem, for me, of what to do with the other 165 burgers. Several calls later, we decided that I would redistribute some of the burgers to other orphanages and the rest would be sent to Shishu Mandir after the other kids came in. That done, I headed out for Shishu Mandir, which was on pretty much the opposite side of town from where I live. While I was at Shishu Mandir, Mighty Grace and Sneha Orphanage, my friends had gotten to the other 11 orphanages. 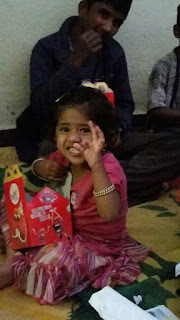 With lots of phone calls, WhatsApp messages and general frustration, we managed to figure out where the orphanages were and make sure that McDonald's did the deliveries on time. What with one thing and another, with the two orphanages that decided to drop out one day before the deliveries, with the orphanage that suddenly ran short of 165 children, we were still able to make 1085 children smile. 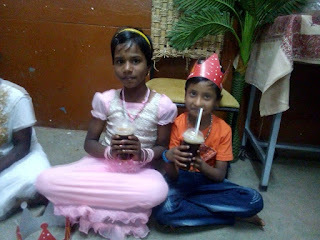 Rishi Sudhir, one of the volunteers, and his parents decided that even the staff of the orphanage deserved a treat for New Years Day and spontaneously ordered 20 extra burgers for them. A huge shout out to (alphabetically) Aditya, Aniruddha, Aparajita, Arnav, Dhruv, Gayathri, Impana, Nandan, Satvik, Rishi, Madan, Aryan, Mishica, Dimple, Pranav, Yugayattri, [Satvik's friend]. You guys were awesome. An equally large shout out to our contacts from McDonald's - Mr. Kedar Teny, Mr. Rahul Shetty and Mr. Karuppan Chetty - you guys were awesome too. Thanks so much to everyone who donated and made this whole thing possible, as well. Thank you for helping us create 1K:). P.S. You can find the rest of the pictures at our Facebook page here.